Tarasingh standing in what was left of his home after the fire. A 52-year-old farmer is counting his losses after his home went up in flames last Thursday. Tarasingh is suspecting arson after he left for Parika, West Coast Demerara to ply his daily trade of bartering goods. The farmer who has been living at Naarstigheid, West Coast Berbice, commonly known as Bath Coconut Estate for the past 25 years, with his 14-year-old daughter, told reporters that he left his home sometime around 23:30 hrs and was on his way to Parika when he received a call. 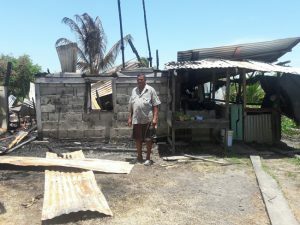 “We leave home, me does normally buy and sell at Parika and while ah deh at number forty village the neighbour call and seh the home on fire and we turn back immediately and we collect the fire brigade but by that time when we reach it was already burnt”, Tarasingh said. He explained that before leaving his home he ensured there was nothing lit, and his two story wooden house uses a mini solar panel, “This house never carry lamp and use solar panel”. He is of the belief that someone may have set his house alight but stated that he has no ongoing issue with anyone. Tarasingh was identified as one of the farmers that was forced to vacate the plot of land by the Region 5 REO. However, he stated that after a meeting with the REO, eight farmers, inclusive of himself, were selected to receive one acre of land. He is yet to receive the land, but continued to stay on the land he had occupied, since he had nowhere else to go with his teenage daughter.